Bike Forums - I'm afraid of enjoying my bike. I'm afraid of enjoying my bike. I wonder if many of you are in the same boat with your prized possessions. Though, I feel most of you may be much older than 23 y/o me. For me, the chances of coming across another 1000 are very rare. I hate it, but I love how the bike rides and everything I read online is true. Though an earlier variant, it is still a dream to ride on. I am planning on a bike tour from Southern Alberta to Vancouver this summer. I am currently building another touring bike with an 87 Grizzly frame. It seems to be more expensive, but I still know the ride quality won't amount to the Miyata. I want to enjoy my Miyata but it's really hard. If I didn't have a hard time finding another one I would use it. They've simply become more rare or more expensive over time. How should I manage this feeling? There are few things that are more sad than a bike that doesn't get used. Of course, those bikes keep the bike industry afloat. You can always have it repainted if it gets too ratty, otherwise I'm not sure what there is to worry about. N + 1. Get a second backup Miyata to ease your fears. I know the feeling well, that's why I have about 8 bikes, stored in various locations, such that it would be impossible for them all to be stolen or get burned up in a fire in one fell swoop. Various Doomsday scenarios fill my dreams at night, and though I ride through the valley of the shadow of death, I fear no evil. Nice job with your Miyata. Don't worry those are solid. I do think age plays into your feelings. When I was younger, my possessions did mean more to me than they do now. At 60, I feel as if I might as well use them, because my riding time could come to an end any time, and as you age, I think most of us don't view our possessions as being all that important anymore. You know, the "you can't take it with you" attitude sets in a bit. Remember, that part of the value of something is not just monetary, its also the enjoyment you get out of it. If that bike puts a smile on your face when you ride it, then why let it sit and collect dust? It is meant to be ridden, so I would at least take it on special rides and not worry much about breaking it or ruining its monetary value. Life is to short not to enjoy that bike. A bike well loved is a bike well used! There are many examples in this forum of some who have have had a 20-40 year relationship with their bike(s). Some are in original worn condition, some still look showroom new, some went through full restoration. You only go around once and you can’t take it with you so enjoy your 1000 by riding it. I have a few collectible cars that I would find hard to replace, so I hang onto them and drive them too. sometimes i feel that way about my bikes, but then i try another bike that fits me and realize there are Boatloads of bicycles out there that are great. one of my bikes is a mtb from the 80's bought new, mostly valued for sentimental reasons. it was great in the day, but today there are plenty of others. it would be missed if taken but surely not the end of things. same with my road bikes, i bought a few old bikes and just ride them all. if suddenly they all came up missing, then within a month there would be another Craigs list or used LBS bike to replace it. maybe you need to find a few touring bikes that fit you well used and it may help get you through this. at my age, well i am just glad to be able to ride at all. over the next 20 years you too will find plenty of great rides, that may even better your Miyata. those types are still being built for riders who like classic touring bikes. Once you put that first scratch on it, it'll get easier! But those frames really are stout, you can ride them hard. I have the same feeling sometimes, especially if it's a real pristine find. Then, (I know this sounds crazy) I think about it from the bikes point of view. It was built to be ridden, to get wet, to go on trips and see cool thing! How sad it most feel being locked away for the past 30 odd years! That makes me want to show it some sights, get it dirty, load a tent onto it! Get it outside into its natural habitat! I also think about Harrison Ford in India Jones and Star Wars. The fedora, the melenium falcon, a good beat up leather jacket... Things of high quality inevitably get a little scratched and bumped and grungy along the way, that's what REALLY well made things end up like, because they were built so well they last for years and years. This state of "beautully broken in" only happens to the well made things, lesser quality items break and are tossed out long before they get promoted from, say, hiking boots to "pet status". "Yeah, right here? That's when it blew over in a wind storm in the Mojave" and "This one? I slipped crossing a washed out road after the flood waters went down." Then You stare into the horizon, sunglasses on Your face reflecting the dying embers of your cooking fire and quietly say "biking? Yeah... I've done some biking." Then secure those beat up panniers that have been patched so many times it's hard to tell what color they were when they were new, straddle the Miyata 1000 that's older than you are and has better stories to tell, if only it could speak, and ride of to parts unknown. Ready to battle for justice like Kwai Chang Caine in the Legend of Kung Fu. Have a nice picture framed for a wall hanger, what you shows looks nice, and enjoy riding it ASAP. I can't speak for anyone other than myself, but the only reasons I have for not riding one of my bikes is because I can't (weather, time, illness, the bike's out of commission, etc), or because I'm choosing to ride another bike. fwiw - I used to own a 1954 Hetchin's Magnum Opus. It was ornate, and I rarely rode it. In my case, it wasn't fear of devaluing it, but rather that I just felt overly self-conscious (aka pretentious) on the rare occasions where I did ride it. After a few years of this, I passed it on to someone who was ecstatic to get it. Another anecdote. One of my first restorations was a 1970 Raleigh Professional. It was distressed, and I had it professionally painted, It was gorgeous. The very first ride I took it on, I wiped out on gravel while taking a turn a hair too aggressively. Mind you, I have never crashed one of my bikes since I was 9 and was jaw-boning with a friend and rear-ended a car due to the distraction. Fortunately, the was no damage to the bike at all, but there were a couple spots where paint was scraped and also a place where a chip came off. 1. Well cared for old bikes are no more fragile than new bikes. 2. Given time, every bicycle will earn the marker of some episode in it's life. 3. While disappointing, small incidents that render your prized bike less than perfect, do not leave lasting trauma. If anything, they remove fears. Ride it man. You will be using it well. true, same with a new car, with use they all become beaters. i have a nice racing Trek, and wanted to keep it that way. so put it up on hooks in the shed till nice days, less dirt etc. my beater Trek comes out any old day as well as the rest. after a while i found that i liked riding my old bikes better than my nice bike on some days. this is close to having your Trek and riding it too. some here also have bikes just for the rainy days, bikes that don't matter how dirty or wet they get. eventually all our bikes becomes rainy day bikes or at least could. There's nothing wrong with having a show piece or two that barely gets ridden. Have a bike or two that you're comfortable taking out anywhere, any time. Both can be enjoyable. I’ve owned 2 Miyata 1000’s in the last year, they are not that rare. Enjoy the bike and ride it the way it was intended. They are wonderful bikes to ride don’t deprive yourself of it. Someday you will be old. Will you want to look at a pristine bike that wasn’t with you on your best adventures, or one with a few scratches that was? All great responses, but I didn't see any that mentioned bar-end shifters. Seems like loaded tourers often tout the advantage of this location...although I'm sure it's a matter of preference. I dig the rear derailleur, is that 3 cogs? 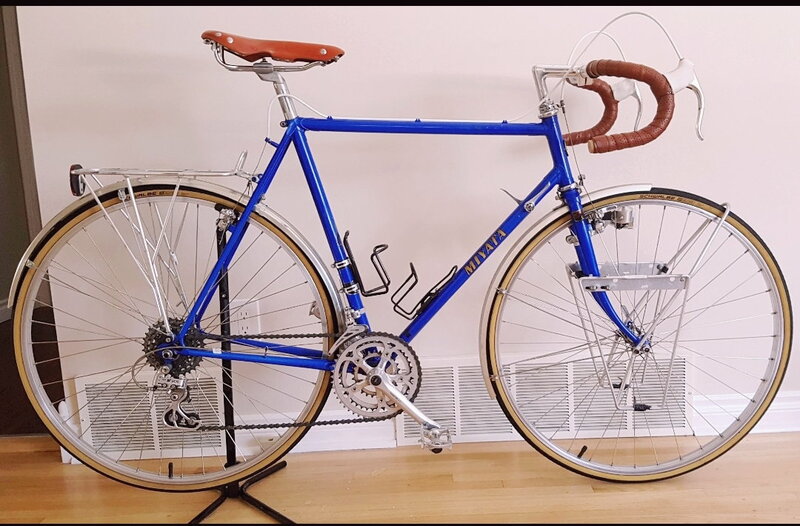 I went to Classic Rendezvous, and the esteemed builder JP Weigel was there with a gorgeous new touring bike, custom paint, fenders, just a gem anyone would be glad to have. We had a ride through town and it rained like the dickens. Across a steel railroad crossing, he wiped out on that bike. The concern was for him. The bike will live and I don't think the value diminished much. Ride your bike. Like your bike. One of the components of value in a bike is what it can do. At bike shows, some of the higher rated bikes show they've been ridden. Put your bike in that category, and you win-win. 1-On your tour, the Miyata is a day faster. 2-On your tour, the Miyata is the expert's choice. 3-On your tour, you meet a bike aficionado....Miyata wins. I have one bike that I don't ride as often as I should. In part it is because it sets up expectations in the minds of others. It conveys an image I'm uncomfortable with. It always becomes "the" conversation. I don't want you to think I'm a snob. I don't want to force humility. I don't want to come off as a bike snob forcing humility. I don't want the bike to be an indication of socio-economic status. I don't want my performance on a group ride (good or bad) attributed to the machine. True: I saved up for it for a long time & when I had 50% I did lay away for 6 months to finish it off. It's still just a bike. Lets talk about my handywork on this Schwinn Varsity or my store brand Scattante or your new compact crankset & derailleur upgrade, or recognize the care you put into wrapping your own bar tape or whatever upgrade you did yourself...Those are much more interesting conversations than: "Wow you bought bike X." IMO. Random idea: Open a savings account or invesment portfolio now and put a little money in it every month. If your Miyata ever bites the dust (big "if"), use the money in the account to buy a custom bike from a framebuilder to replace it. You can match the geometry and even get some nice features that your Miyata doesn't have. I found that with a little (or a lot of) care, a bike can be ridden thousands of miles and still look like new. When I see how beat up some bikes are I often wonder if their owners park them by jumping off and allowing them to crash into the pile. I don't want to come off as a bike snob. I don't want it to be an indication of socio-economic status. Assuage your guilt. Divert your fears and apprehensions. Wear your favorite old t-shirt on the beauty of a bike. Use flat pedals and wear cargo shorts. "I just like it" goes a long way. Don't worry. When the Project One tri-bikes first came out, I went to an Olympic-distance triathlon, drawing folks from 6-7 states. I rode an Ironman, but I noticed a guy with a new $12,000 gem. He (gasp!) did not have aero booties for his shoes, a teardrop helmet, or a speedo bikini between him and his saddle. I walked over, and said "Man, if George Jetson had a bike, that would be it." He was quiet, and I surmised he'd been speaking of this bike, to these "buy speed" freaks, for the entire morning. "I just like it." He said. "I'm no faster, just a bit. I don't golf or fish or hunt; this is my only vice." "Good enough for me," I said. "If you like it, everyone else can just get bent." He laughed, said "always an Ironman in the crowd." We talked for about 30 minutes about the process of design, ordering, etc. He had hours of interesting and rewarding time on that bike before he ever saw it. He smiled when he rode it. That's more than enough. Big John Murphy paid $6000 for a custom Iglehart touring bike (because he's a giant) and rode it solo, unsupported, across the US in about 3 months. By the time he got to Wisconsin (from California), the bike had tons of wear and tear. It was starting to rust a bit under the clear (unpainted). It make absolutely no difference. What do you think he remembers about that trip? The bike, or what he did while on it, and the people he met while off of it? There you go. Here on BF, it's kind of about the bike, but kind of not. We always know there's a bike in the room. It's our vehicle to get to each other. Ask the bike. Ask it where it prefers to be: inside at a standstill or outside in motion. Ask the bearings, waiting to spin. Ask the cables, waiting to be pulled. Ask the tires, begging for road. Ask the frame, eager to show off the magic of adventure locked up in its brazing and geometry. Ask the bike.